This one-day-workshop will provide you with the basic elements of photo-emulsion-screen-printing and will introduce you to an economic way of transferring your own designs using the emulsion premix, a transparency, a halogen lamp and some basic home items. Each participant will transfer a design of their own to the emulsion coated screen using a transparency and a home-made exposure unit. Then, several prints will be made using different colours and surfaces. Each participant will walk away with at least four prints, and their design on the screen printing frame. 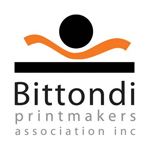 Cost: $140 for non-Bittondi members (this includes a 1-year associate membership for Bittondi Printmakers Association). $120 for Bittondi members. Suitable for people with a basic understanding of screen printing or more experienced printmakers, come and refresh your skills or fill your Professional Development for the 2018 with this great workshop. Non-toxic, water-based materials used (all included). A couple of designs or ideas suitable for an area slightly smaller than an A4 size sheet (size of a standard photocopy paper). Remember we are doing one colour only, however you can write some text or incorporate silhouettes from photos, try to avoid too complex designs with too many details. If you would like to experiment, bring additional printmaking paper or fabric materials (4 A3-sheets of Canson drawing paper 220gsm plus proofing paper will be provided). Comfortable clothes you don’t mind getting stained. A light lunch and drinks (there is a small oven, a microwave and a fridge at Bittondi). To confirm your attendance, please contact Camilo at camilo0001@hotmail.com or 04-33-432-338 a deposit of $60 is required before the 1st of November in order to buy the materials for the workshop.